Lemon Possett is so easy to whip together, that only tossing a bag of Skittles at your guests could make for a simpler dessert. Take a bite of this deliciously light, lemon pudding and you would never guess that it only contains three ingredients: sugar, cream and lemon. Normally my go-to dessert is creme brûlée, if I’m in the mood to treat others with something fancy and elegant, but this zestier, unscorched cousin of the brûlée is quicker and sure-fire, without having to worry about finicky egg yolks or burning down the house with the kitchen blow torch. The secret to serving a possett is to keep it chilled until seconds before serving. Moments after biting into it, it will begin to melt, and if you leave room for conversation in between bites, you’ll be left with a ramequin full of lemony juice. 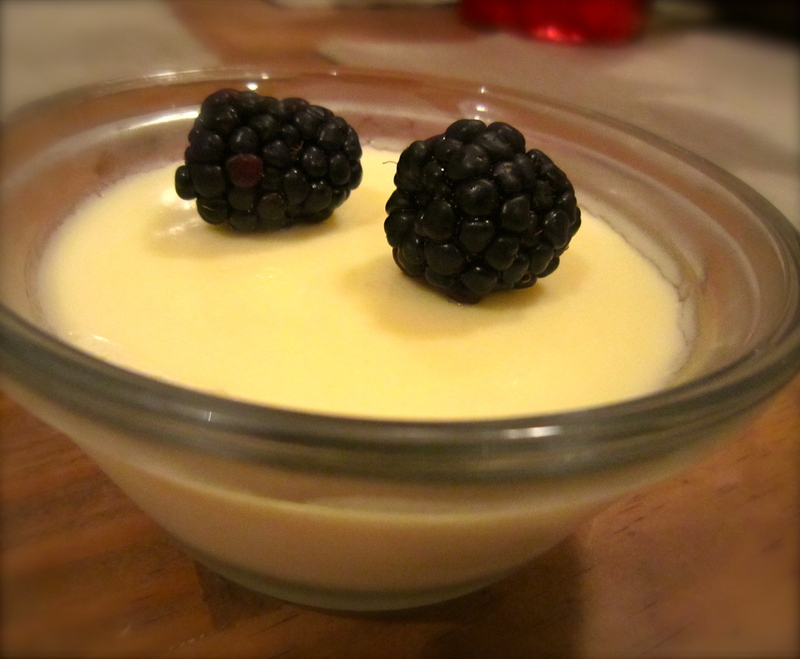 The intense lemon flavour make this a very light dessert, perfect to pair with a dinner of seafood or chicken, or with heavier meals where maternity stretch pants are in order. So essentially, eat it anytime. 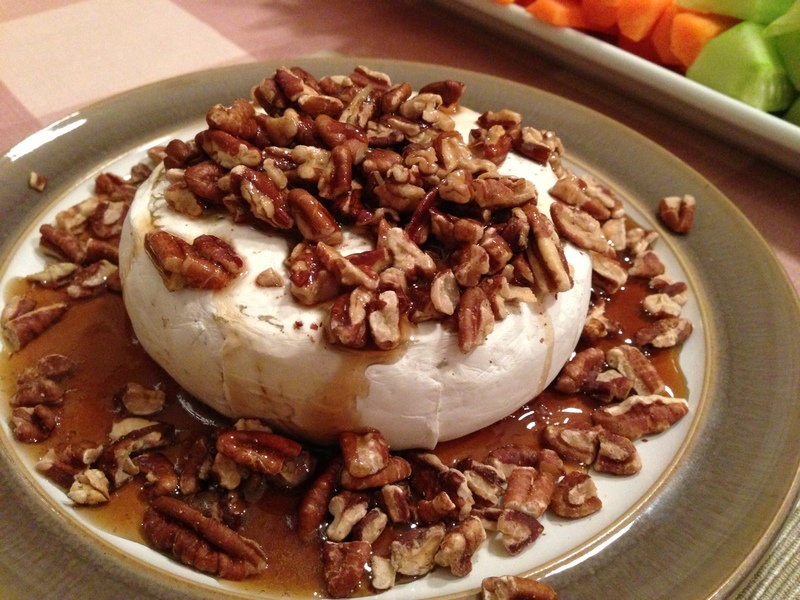 We hosted a fondue night for friends last week and decided to try an appetizer of baked brie with toasted pecans, drizzled in warm maple syrup. Either of these on their own would easily make my list of top “stranded desert island” fare, but together they were a triad of decadence that did not last long on the plate. This is a quick and easy appetizer that offers a refreshing variation to the traditional Brie and baguette duo that many hosts foist upon their guests. Once you’ve tried a warm creamy Brie or Camembert, dressed in any fashion, your self restraint for second helpings will be nil, and you will forever turn your nose up at Brie that has not seen the inside of an oven. Today marked the end of my short-lived backyard apple season as the last apple plopped to the soggy grass. My two, now bare, apple trees remind me of autumn family trips as a child to an orchard in Oka, Quebec. I remember climbing up the trunk of each apple tree, like a simian, and entangling myself in the upper branches elatedly. I loved the pull and twist of the fruit, with arms outstretched. I loved the quick polish of fruit on my grubby shirt sleeve, back before washing one’s fruit came in style, and the ultimate, mouth-watering crunch that followed. My brother and I would leave the orchard with belly aches from having gorged ourselves greedily on fruit, and would sneak past the gates with bulging pockets bursting at the seams, like those pirates in movies who stuff gold doubloons in every orifice as the ship is sinking. I’ve been trying to find a use for the late-fallen apples from my two apple trees that didn’t fall early enough to make it into the now-fermenting batch of cider. This year’s harvest has been used in a couple of pies, a recent fruit crumble and enough homemade apple sauce to supply my local Costco. I also stumbled upon a variation of traditional stove-top apple flapjacks which I had to try. 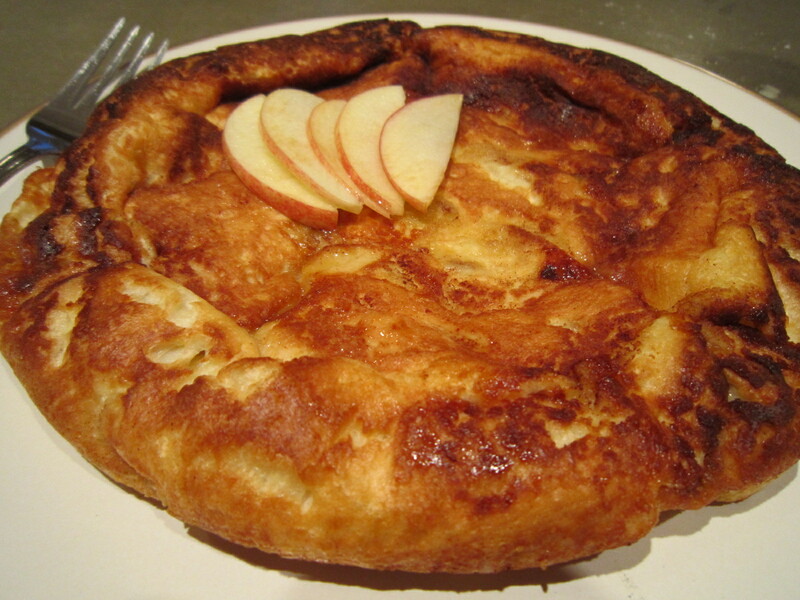 Apparently German in its roots, this “oven pancake” gives the pancake a puffy, shell-like appearance that is both filling and slightly reminiscent of a distant Canadian cousin, the Beaver Tail – my favourite Quebec export after Maple Syrup, Poutine and Blanche de Chambly beer. Enjoy! I have been feeling slightly sick lately which, for me, sends off signals in my brain to eat comfort food. My list of preferred comfort food is mercifully short: Kraft Dinner, Butter Chicken, Chicken Noodle Soup and Chicken Pot Pie. 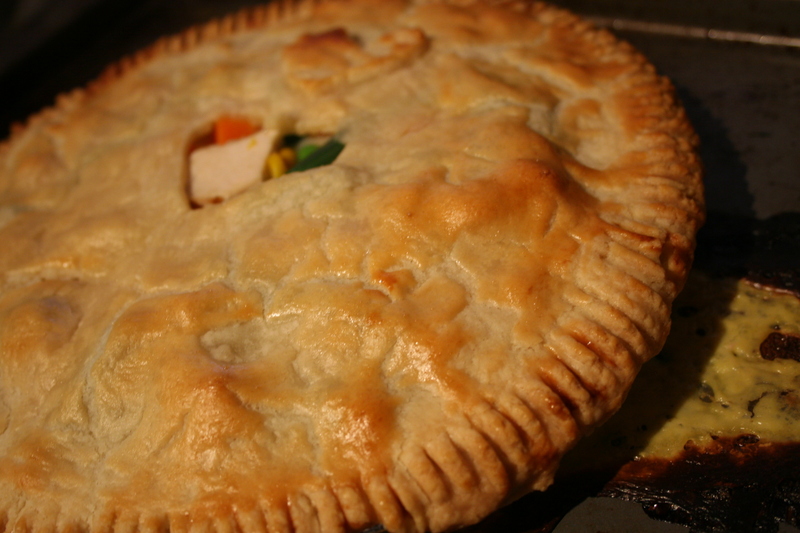 This recipe for Chicken Pot Pie is incredibly fast and yields delicious results. Hope you enjoy! Mix the cut-up chicken, vegetables and chicken soup together in a bowl. Stir remaining ingredients in with fork until well blended. 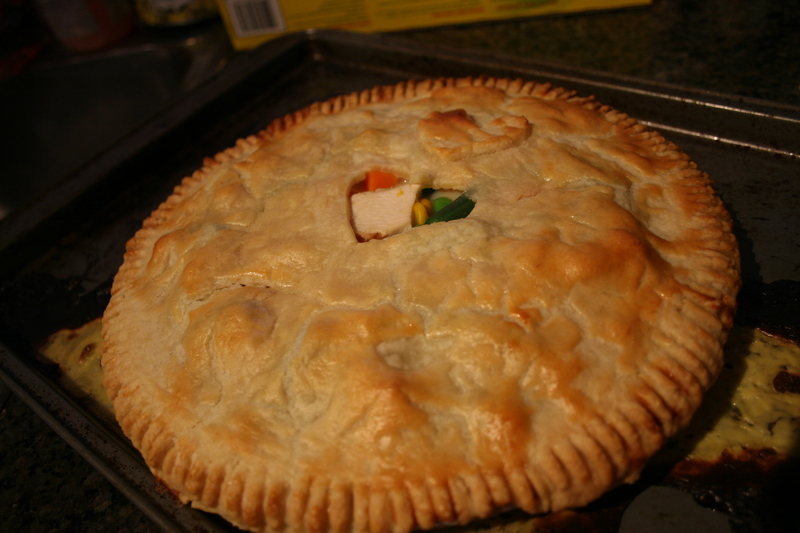 Pour mixture into one pie crust. Take the second pre-made pie crust and place overtop of the first. Use your fork to press down along the rim to hold the two dough pieces together. Cut air-vents on the top (I chose to indulge myself and made a heart-shaped hole). 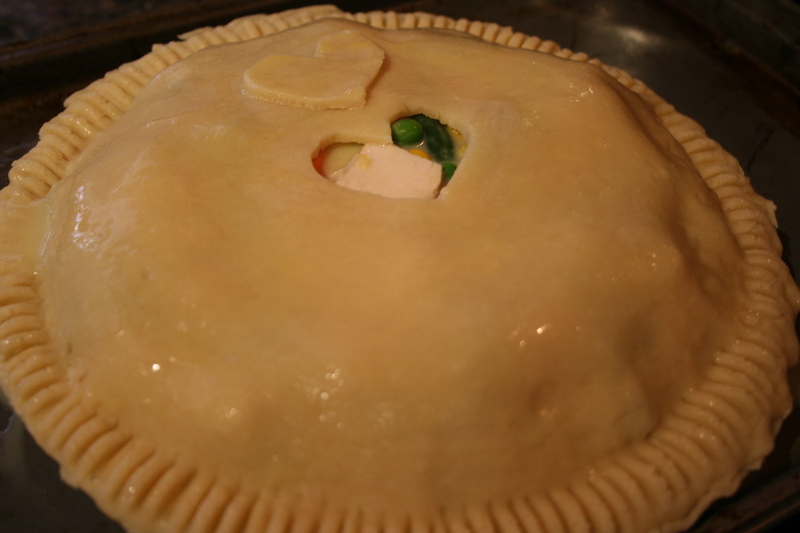 Whisk an egg in a little bowl, and use a brush to lightly cover the top of your pie with it. Bake for about 30 minutes, or until golden brown on top! 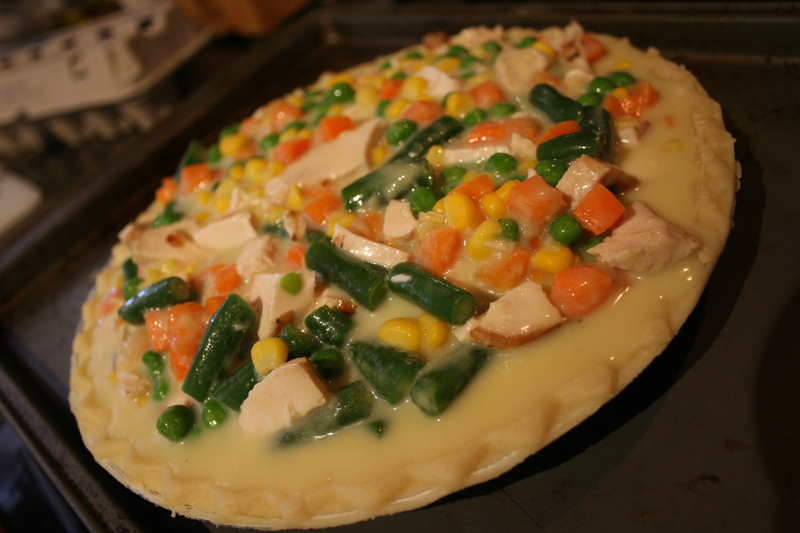 (I put my pie onto a baking sheet, just incase there was any leaking). That’s it! Super easy and fast ( and tasty). What better way to follow a post on homemade ice cream than with this mouth-watering variant of fruit pie. I had a craving tonight for something sweet and summery, with a crumbly crust that melts on the tongue, so conceded to this rustic fruit tart. 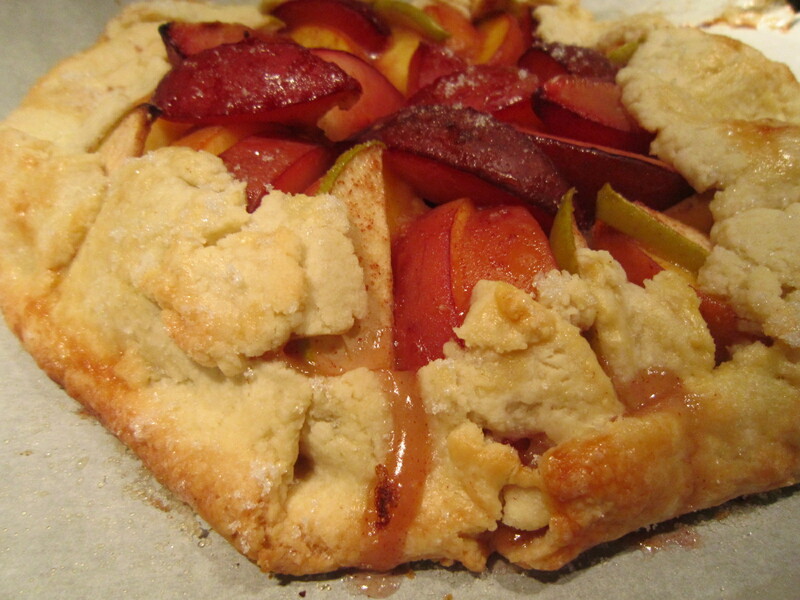 While I don’t have a bad word to say about traditional pie, its near relative – the galette – is a delicious alternative. It’s a dessert that one doesn’t typically see at a potluck, say, or a dinner party, so if you’re looking to jazz things up a bit and get your friends clucking in excitement by your end of the table, a galette may just do the trick. Or a nacho sampler, if that fails. Aesthetics aside, a galette is also easier to make than pie, as it only requires one bottom crust, which folds free-form over the filling and is then baked. As a filling, I used plums, peaches and granny smith apples, but you can create these tarts using any combination of fruits, I’m sure, including blueberries which have just come in season here in the Pacific Northwest. Be sure to serve the galette warm with a generous dollop of creme fraiche or vanilla ice cream and you’ll be guaranteed an invite again to the next potluck. A few months ago I subscribed to a BBC Podcast called the Food Programme, which I now listen to regularly while driving or when I’m really hungry and no food is available. One episode which I particularly enjoyed, on the joys of homemade Ice Cream, made claims that all-natural ice cream was richer, creamier and more decadent than commercial brands. A new kitchen gadget I had to have and Christmas was so far away. Unable to wait that long, I picked up a hand-crankable Donvier ice cream maker from my local kitchen store, on sale for $50. A bargain, for sure, as I did the math on the money I would save by eating a lifetime supply of frozen desserts that could be concocted at home in 20 minutes or less. Ice cream makers, whether electric or hand-cranked, should be an indispensable tool in your kitchen, as they can whip together more than just ice cream: there are literally thousands of recipes for sorbet (a water-based frozen dessert containing no milk or cream), sherbet (dairy-based dessert, usually lower in fat, but sweeter than ice cream), frozen yogurt, or gelato (intensely flavoured Italian ice cream of a softer consistency). 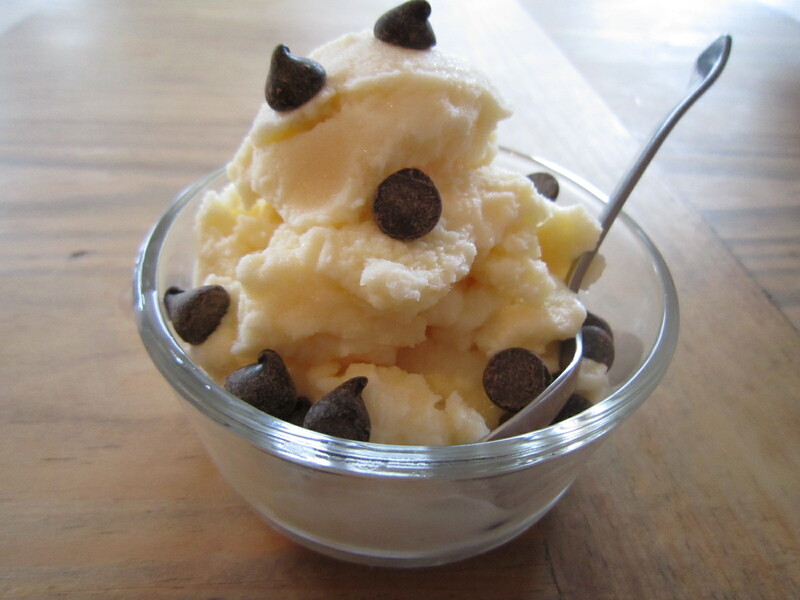 If it is liquid and somewhat able to freeze, chances are it can be made into an ice cream. Guinness ice cream, anyone? Yes, I know French Vanilla is plain and boring, to some, and perhaps indicative of my personality type or some deep-seated mistrust of my mother, if you put any stock in Ice Cream Psychoanalysis. Truth is, it’s been my favourite since I was younger and I enjoy sprinkling it with chocolate chips when I’m feeling a little crazy. Don’t try to read too much into it. A colleague at work has just abandoned we cubicle rats for a month to vacation in the hot Italian sun. She has spent the past two weeks reminding others of this fact; and although I keenly do the same when it’s my turn to escape abroad, I’m no less aggrieved and envious when left behind. But why be jealous, really? Sure, Frommer’s says nice things about it; but Italy isn’t all Sistine chapels, olive-skinned supermodels, or linguine heavenly enough to make Julia Roberts swoon. And I’m sure that more people die on wobbly Vespas in Rome than of bee stings here in Canada. So there. Ok, this isn’t working. I’m obviously in denial. Admittedly, Italy has been on my bucket list for a while, even if my mother tells me it was noisy, dirty and full of pigeons and creepy men who stare. That sounds pretty much like where I live now, or at least no worse. Give me the Vespas. Give me the green pastures, luscious grapes hanging heavily from the vine, warm bread dipped in olive oil, or an impassioned, heart-wrenching Italian aria. Heck, give me lice from sleeping on a dirty hammock, if it means getting to bask in the Mediterranean sun for even one afternoon. Apparently I’m in need of a holiday and thankfully I have one approaching…though not to Italy. 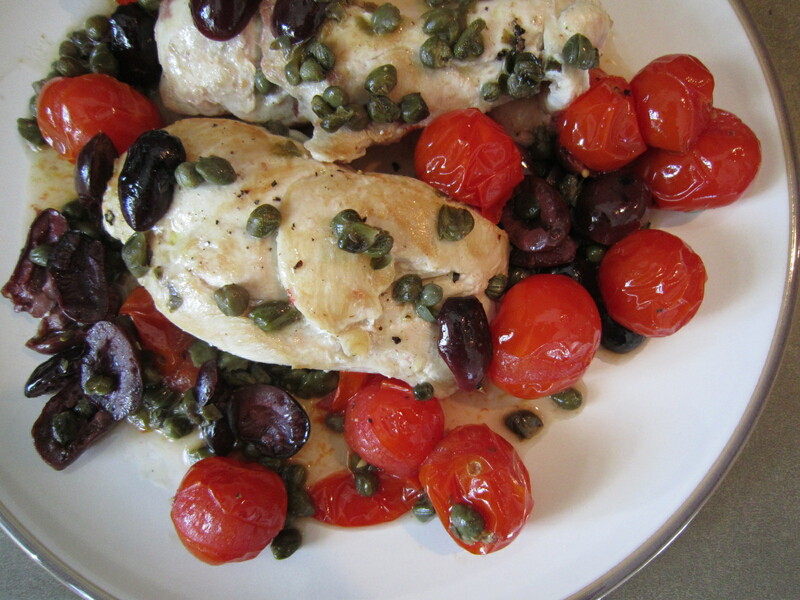 While waiting for my credit card travel points to slowly accumulate enough to cross an ocean, I’ll travel in the meantime by other means: Tonight I made this Italian-inspired dish with pan-roasted chicken, kalamata olives and roasted cherry tomatoes, I savoured a glass of red wine, and listed to Verdi’s La Forza Del Destino while yearning desperately for another continent.